Dev Update #16: What Lurks in the Shadows? BUGS! Have you ever accused someone, of living in an echo chamber? Of living in a small space that shares so narrow a slice of world view that, eventually, that person couldn’t believe anything else? Well, here are Gears of Eden, we had a similar experience this past week. If you follow us closely, you may have seen our most recent Dev Update where we talked about adding a bunch of variety to the landscape. Now, the updates we made aren’t permanent; we’ll want the end product more precisely laid out to reflect our designs. We did it though, because the asteroid that we’ve been testing on is so smooth, empty and boring. It’s such a largely spherical, slightly oblong rock with a few craters and hills that can be easily traversed. This is great for getting around and figuring out what gathering is going to be like, but it’s also pretty limited. We need structures and environmental barriers to make Gears of Eden a fun game. So we added a bunch to our surface, just to shake things up and provide a testing grounds for implementing such assets. Then, all hell broke loose! Well, that’s dramatic, but it showed us a minor flaw in how our player movement system works. Not only is it super easy to clip through, or even into objects, getting stuck forever, it’s even easier to just drive up the walls! 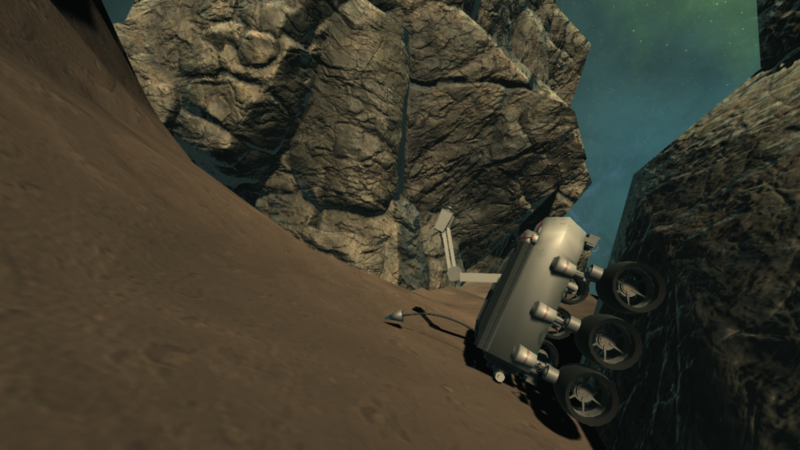 Outside of our current starting point, there’s a “base” that we can drive into, but it’s hard to leave because it’s just so easy to accidentally drive up a wall and get stuck on the ceiling. For some reason, the glass that is so easy to drive up is an impenetrable barrier for getting down. So then you’re just stuck, hanging from the ceiling without a bit of glue on your tires. Honestly, as far as bugs go, these are pretty fun to discover. It’s also a good thing that we’ve spotted this because it means that, when you get your hands on Gears of Eden, you won’t be driving through boulders and into Platform 9 3/4. That’s it for this week’s Dev Update, but if you’d like to hear more from us, be sure to follow us on Twitter and Facebook! We also have a e-mail newsletter that you can sign up for and get a chance to become an alpha tester! Thank you so much for your continued support of our little project, it really means the world to us. We’d love your support as a backer! If you’re interested, check out our rewards page!